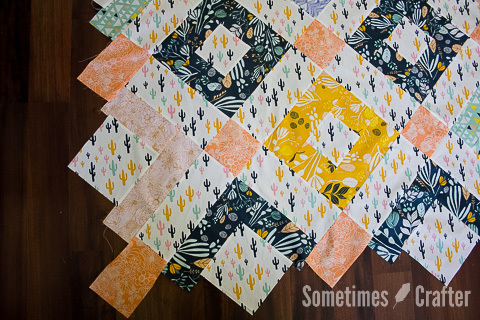 I am so excited to share this quilt with you, I only wish I had the time to quilt it before this post! I have been out of town for a few weeks, so I had to hurry to get this pieced the last two days, so quilting will be happening this weekend I hope. 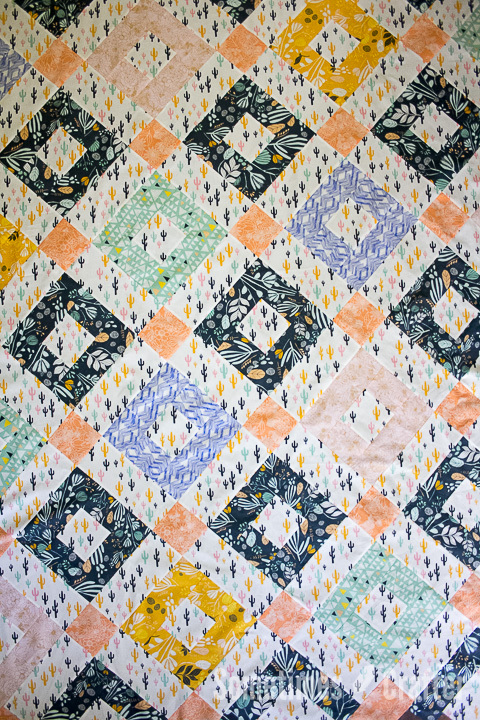 The pattern for this round of AGF Stitched with Kimberly is the Welded Quilt by Art Gallery Fabrics. It’s a very simple quilt to piece, but due to the nature of the piecing you get a really great square turned on point. As with all the AGF Stitched quilts, this is a free pattern to download. I really wanted to make a quilt out of Leah Duncan’s Morning Walk line, and with the soft and bold colors, and mix of shapes/textures in the prints, I thought they would work out well for this quilt pattern. 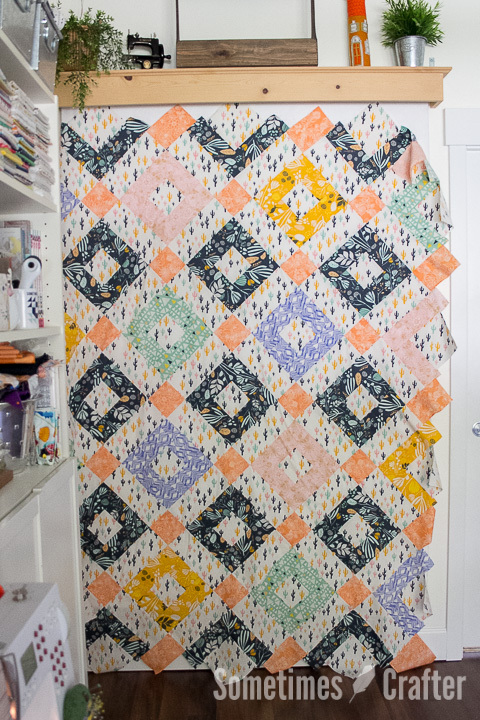 The original pattern calls for a lot more prints, but I simplified things a little and made a more uniform “background” with my sashing strips and square centers all made of the same print. 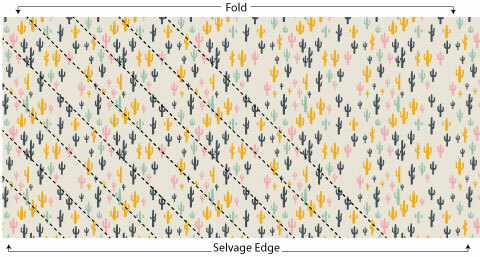 Originally I thought about going with the Wispy Daybreak Aura print for the “background” of quilt top, but I kept getting drawn back to the cactus print. I just thought it would be so striking to have this directional print as the background. I knew it would take a little more time and thought with cutting and piecing, but I just felt it would do the top justice. Because this print is a one direction print, I had to cut my fabric at a 45-degree angle, which meant I was working with fabric on the bias. When working with fabric cut on the bias I like to lightly starch the piece before sewing, and I also am sure to pin my fabrics together. Doing this ensures I don’t stretch the fabric as I sew. Stretched fabric when sewing makes for bubbles in quilt tops when quilting – and that is a nightmare on the longarm. As I said, the quilt is a really simple top to piece, but of course with my directional print (and TV shows to distract me) I ended up doing a lot of seam ripping. Leave it to me to make the easy piecing so much harder than it needs to be. That’s okay though, the outcome was definitely worth it. I am in love with this quilt top and would do it all over again. Seeing this top makes me feel like I’m in the desert seeing the flowers bloom among the cactus. If you would also like to make this quilt top with a directional print you’re going to want to cut fabric strips at a 45-degree angle. I recommend cutting them with the yardage still folded as it comes off the bolt. Then subcut your smaller pieces from those strips leaving the fabric strip still folded. For each cut you make you will have a print piece that runs from top left to bottom right, and another piece that runs from bottom left to top right, as illustrated in the diagrams above. You’ll need these two directions to complete the top in the same manner. And as I mentioned, this means the fabric is being cut on the bias which means it will be stretchy, so consider lightly starching them and/or using pins when stitching the pieces together. I’m really happy with how the quilt turned out and I’m glad I took the time to work with the directional print. Sometimes it’s worth the extra effort. This is a rather large quilt (at least large by my standards) so I’m looking forward to quilting this one up to drape across our bed this spring. I’ll share photos as soon as I get it quilted. 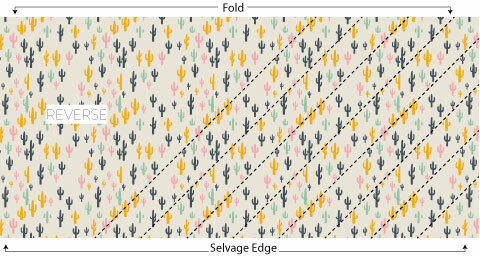 I’m thinking i’ll stay with the desert theme, and look for a desert flower to quilt, or maybe even a neat cactus design. You can watch my Instagram feed as I usually share in progress photos as I’m quilting. Be sure to check out the Jolly Jabber post for links to all of the Welded quilts made by other bloggers. I’m really looking forward to seeing what fabrics everyone chose. The pattern is free to download at Fat Quarter shop, and they have kits available for purchase using Pat Bravo’s Artisan line. As you might have noticed in my photos the edges of the quilt are rather jagged at the moment, but that gets trimmed off to be nice square edges and Kimberly walks you thought how to do that in her YouTube video on the making of this quilt. A lot of times I leave edges like this and trim it after I’ve quilted, and that’s the direction I’m leaning this time as well. Below are all the links from this post, plus a few. Notes: For this version of the Welded Quilt you will want to use the same print for fabrics F & G, L & M and N. These cuts will all need to be cut on a 45-degree angle, as mentioned above, with diagrams. Finished quilt measures 61″ x 79″. When I saw your background fabric and the placement of the blocks, I knew you were crazy brave to cut it all on the bias!! Isn’t it fun when the fabrics demand you take the hardest route??? You did a fabulous job and the quilt looks so awesome!! Aren’t you the brave one. 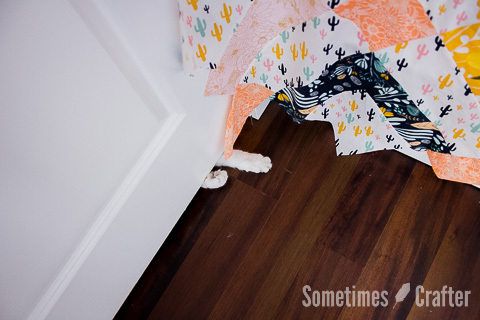 You did a great job with the cactus fabric and showing how you did it. Great combo and work – thanks. I love your choice of fabrics! 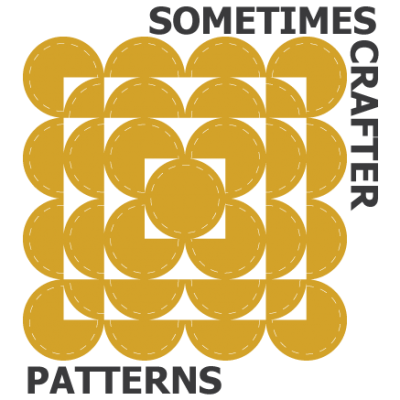 It’s fascinating to see all the variations of this pattern in the blog hop. Yours is my favorite so far. I’m Christina Lane, the Sometimes Crafter since 2008. I am a professional Longarm Quilter (est. 2005), pattern designer, quilting instructor, and co-author of Quilting Happiness. My days are spent at home working in my studio, homeschooling my son and taking care of our kitties, ducks, goose, chickens, rabbit and bees. Follow my daily adventures on Instagram @SometimesCraftr. I’m Christina Lane, the Sometimes Crafter since 2008. 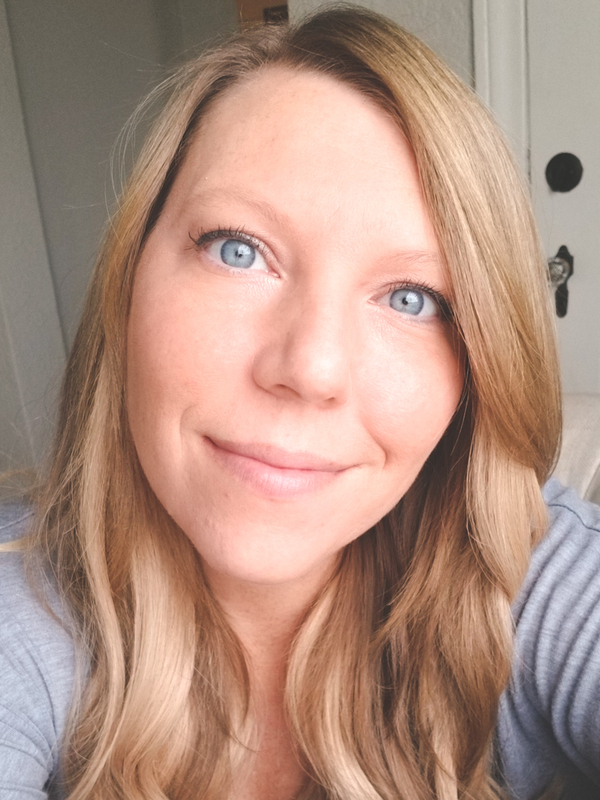 I am a professional Longarm Quilter, pattern designer, quilting instructor, and co-author of Quilting Happiness. Homeschooling, gardening, caring for the bees, ducks, geese, chickens, rabbit and cats take up most of my free time!